For any regular readers who read my New Year's Eve post I exclaimed about finding $140 in the movie theater on NYE, which I felt was a good omen for me and Tinsel & Tine for 2012. 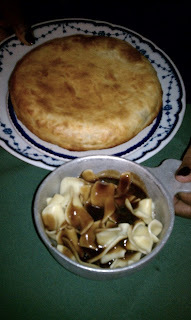 And I felt the best thing to do with the money was spend it on dining out, thus completing the circle of film and food. My Aunt watches Chef Walter Staib's show on PBS "a Taste of History" , where each week Chef Staib prepares cuisine from the 18th Century. So with the windfall, I decided to treat her to the historic dining experience of his establishment City Tavern Restaurant (138 South 2nd Street at Walnut St). The tavern was built "for the convenience and credit of the city" by a group of eminent Philadelphians who felt that their hometown deserved a fine tavern which reflected its status as the largest, most cosmopolitan city in British North America. When the tavern was completed in 1773, it was one of the most elegant buildings in the city. Situated where it resides today on Second Street, then a main thoroughfare. Inside, it "boasted" several club or dining rooms, (some large enough for ballrooms) lodging rooms, two large kitchens, a bar, a coffee room and attic for servants quarters. In 1774 the tavern was thrust center stage in the dispute with England. From that time until the close of the century the City Tavern knew the patronage of the great and near-great of the American Revolution. After the war, City Tavern settled into a more sedate existence which was not interrupted until the opening of the Constitutional Convention in 1787, when once again, these leaders enjoyed the hospitality of the City Tavern. However, by 1834 it began to lose its place of prominence and in 1854 was demolished to make way for new brownstone stores. In 1975, after painstaking research, the National Park Service rebuilt the City Tavern. Today, the tavern appears essentially as it did two hundred years ago, even down to the front awning which shielded the tavern from the summer sun. Both the National Park Service and Concepts by Staib Ltd, the tavern's operator, have made every effort to faithfully recreate the tavern and the culinary experience to the way it operated during the American Revolution. 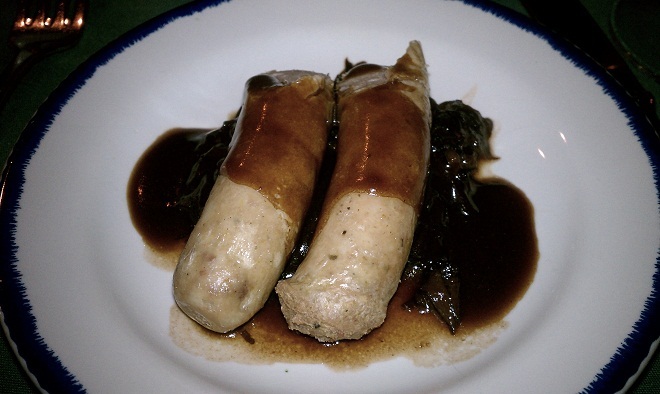 I also suggested we start with an appetizer of : Mallard Duck Sausage - Broiled duck & pork sausage, sweet & sour cabbage $9.25 rating: 2 Tines - It was good, just not exclamation good. Actually enjoyed the cabbage more than the sausage. I check into Foursquare upon arrival and discovered an offer of a free dessert for my efforts. 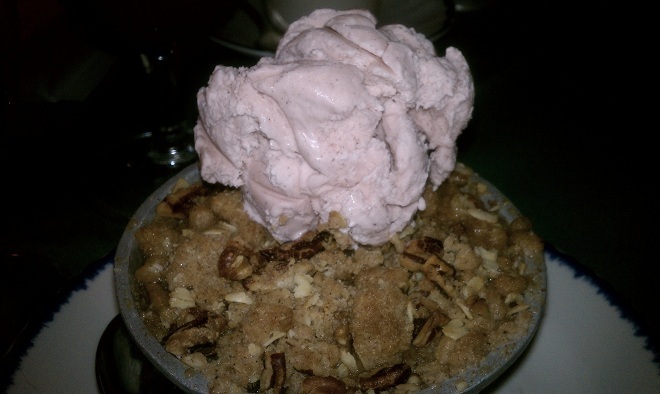 We choose the Apple Crumble rating: 2 Tines - When I order this dessert, I always want the apples to be a compote, not hard slices. I'm sure traditionally the apples are supposed to be intact, but for me, that just means I eat the crumble and ice cream and leave the apples. By the way, the a la mode was Cinnamon Ice Cream, which I adore. Always a flavor hard to find. 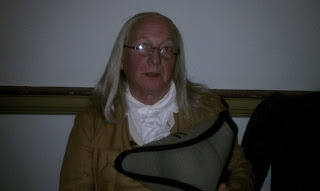 Two additional treats of the evening 1) Benjamin Franklin was sitting two tables away from us. Ok, it's the guy who does the historic tours in Olde City; still it was cool to see him in the Tavern. When I went over to ask him for a picture. He spoke to me in character. I never knew he introduced soybeans into the country. Franklin sent the beans and recipe for Tofu (smuggled out of China) back to John Bartram (Bartram's Gardens - where my sister got married). I would have thought this country didn't start eating tofu until the mid-1970's not 1770's. 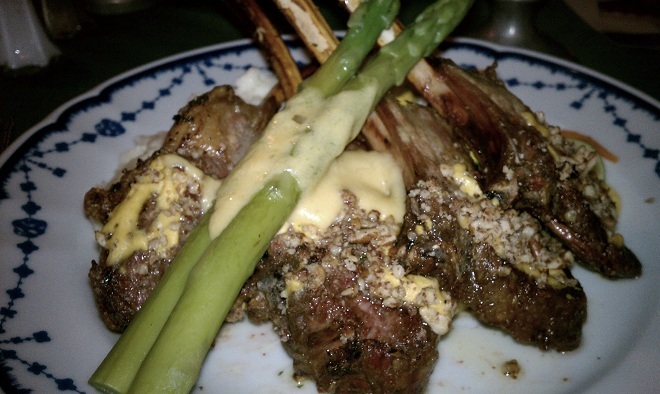 2) The service was excellent 4 Tines! All the waiters were friendly and informative, not just Lachlan who was our stellar server.